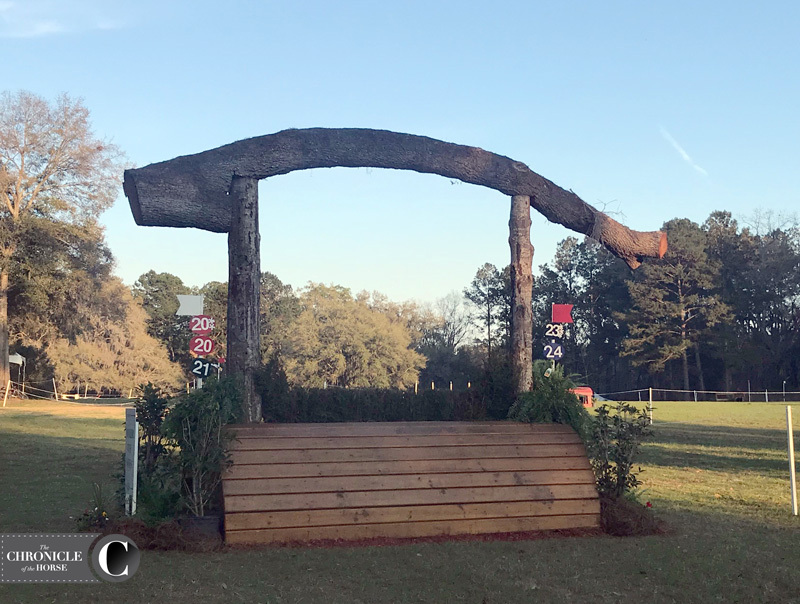 The Red Hills International CIC*** cross-country course has a new look and feel this year. 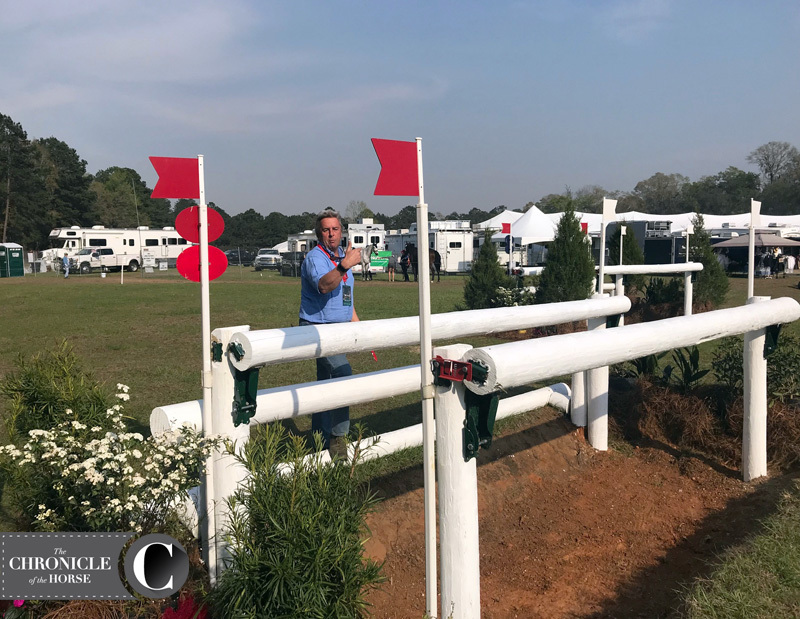 Course designer Mike Etherington-Smith has reversed the track and opened it up a bit by removing some trees in Elinor Klapp-Phipps Park, so he hopes it will flow better for riders. With an optimum time of 5 minutes 59 seconds, 23 numbered fences and 35 jumping efforts, there will be a lot to do. Click here to see photos of all the jumps with commentary from Etherington-Smith. 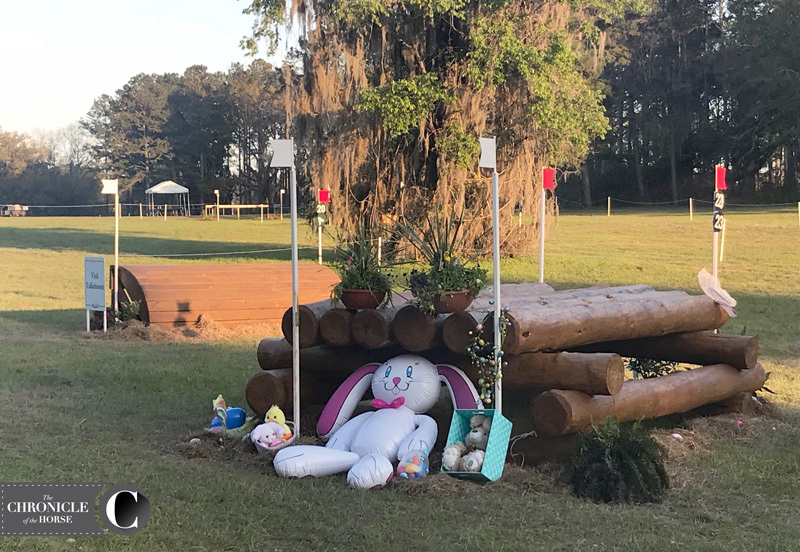 Etherington-Smith is aware that Red Hills is serving as a qualifying event for the FEI World Equestrian Games (North Carolina) in September, but that didn’t influence his design. He stills wants a confidence-boosting early season course that’s challenging but not dummied down. Mike Etherington-Smith discusses frangible pins on a newly resigned jump. Photo by Lindsay Berreth. 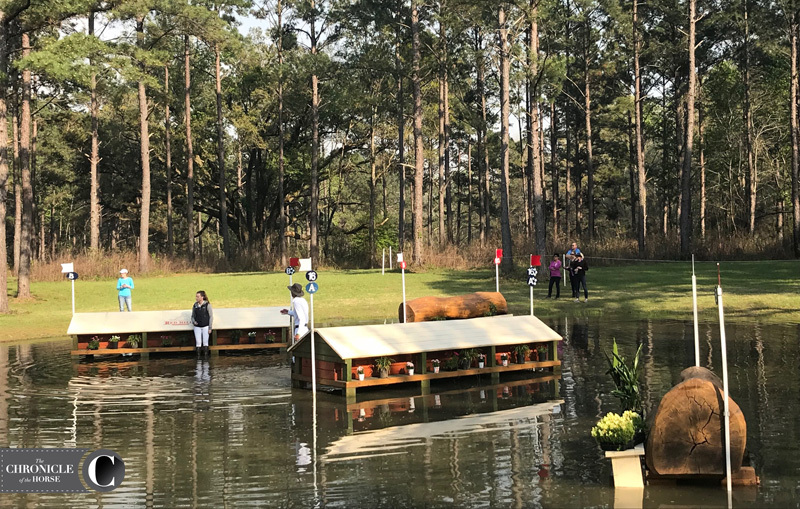 The designer has worked with the water management team at the park to ensure he preserves the beauty of the park while making the course more horse-friendly. “This is the fourth year I’ve done it,” he said. “I’ve opened it up quite a lot. There were basically too many trees in the way! Trees are a bit of a hazard, and one or two people have driven into trees in the past. I’ve tried to improve the flow, improve the feel and improve the balance of the track. When designing a course, Etherington-Smith says he asks himself what the reason or added value is to placing a jump in a certain way. He makes sure to always challenge himself and be his biggest critic, and he hopes other designers do as well. He’s a member of the FEI Risk Management steering group, so safety is always on his mind, and he’s a big supporter of frangible technology, which is utilized throughout the courses at Red Hills. “I think the sport is at a tipping point,” he said. “Risk management is a big thing. We’ve got to be very careful about some in certain parts of the world who are quite keen to see fences deform more easily and more quickly, and that could change the sport. If you want to change the sport, that’s fine, kick on, but we’re borderline now changing cross-country riding. It could, if we’re not careful, go down the line of setting show jumps all around the cross-country course. They wouldn’t be show jumps, but the way of riding would go that way, which would lose the essence of why people do it.